BinaryOptionsNow – Renowned forex trading company Trader’s Way announced that from now on it would offer binary options trading services to its clients. The new binary options trading services that are about to be offered by the company will run on the very popular SpotOption binary options platform. The SpotOption platform will permit Trader’s Way clients to trade binary options using a large number of popular assets and options ranging from regular high/low options to more complex and higher paying types such as touch options and 60 seconds options. Trader’s Way binary options clients will also be able to trade on weekends and public holidays. This is because SpotOption earlier in 2014 implemented a new feature called Trade On! That allows round the clock trading. The company further explained that all existing forex clients would not have to open a new binary options account in case they wish to trade binary options as well. Forex traders will be able to access the new binary options platform using their regular MetaTrader 4 login details. The fact that Trader’s Way decided to implement binary options is a clear signal that shows that the binary options business continues to grow and evolve. In the early days of the business binary options were mostly being offered by standalone binary options brokers only. These brokers were mostly smalltime companies and startups that did not have a lot of experience in the online trading business. Some of these companies have grown out to become massive ventures that are now licensed in regulated in several European Union member states. Forex companies only began to add binary options into their service package once they saw the success achieved by the former smalltime binary options companies. Today several major forex companies are already offering binary options trading services and more are expected to join as well. 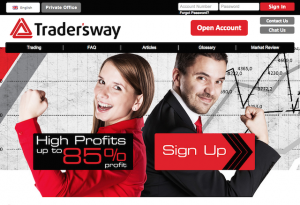 Trader’s Way is the latest company to join the ranks of businesses that offer binary options trading. The company revealed that it decided to take this step due to an increasing market demand on behalf of its traders and in order to avoid traders leaving for other forex brokers that have already added binary options into their service portfolio. The company explained that after the launch it would evaluate the feedback received from traders and if necessary implement needed to changes. Many binary options companies have in the recent past decided to implement various unique and special features in order to distinguish themselves from their competitors.Trader’s Way is expected to do the same. Trader’s Way is a Dominican-registered forex broker that offers trading services for international clients. New traders can use various platforms to trade such as the popular MetaTrader 4 platform, which also allows free demo trading mode. From now on traders are able to trade binary options as well.